Growth: A permanent and irreversible increase in size of an organ or its part or even of an individual cell is called growth. Growth is usually accompanied by metabolic process; which occur at the expense of energy. Indeterminate Nature of Plant Growth: Plants retain the capacity for unlimited growth throughout their life. This becomes possible because of the presence of meristems at certain locations in the plant body. This type of growth in which new cells are always being added is called the open form of growth. Phases of Growth: The growth can be divided into three phases, viz. meristematic, elongation and maturation. 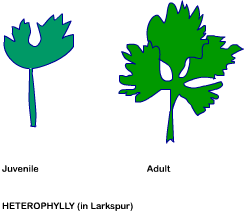 Meristematic Phase: The constantly dividing cells of the root apex and the shoot apex represent the meristematic phase of growth. The cells of meristematic region are rich in protoplasm and posses large conspicuous nuclei. The cell walls of these cells are primary in nature, thin and cellulosic; with abundant plasmodesmatal connections. Elongation Phase: The proximal cells which are just next to the meristematic zone represent the phase of elongation. In this phase, there is increased vacuolation, cell enlargement and new cell wall deposition. Maturation Phase: Next to the phase of elongation lies the maturation zone. The cells of this zone attain their maximal size in terms of wall thickening and protoplasmic modifications. Growth Rate: The increased growth per unit time is called growth rate. The growth rate can be arithmetic or geometrical. Here, Lt is length at time ‘t’, L0 is length at time 0 and r is the rate per unit time. Geometrical Growth Rate: In most of the cases, the initial growth is slow and is called the lag phase. After this, the growth is quite rapid and at an exponential rate. This phase is called the log or exponential phase. In this phase, both the daughter cells (formed after mitosis) continue to divide. The last phase marks a slowed down growth. This happens because of limited nutrient supply. This phase is called the stationary phase. The graph of the geometric growth gives a sigmoid curve. Water: Plant growth is closely linked to water status of the plant. Water is required for cell enlargement and also for turgidity. Turgidity helps in extension growth in cells. Moreover, water provides the medium for enzymatic activities needed for growth. Oxygen: Oxygen is another important factor for growth. Oxygen helps in releasing energy which is utilised in growth activities. Nutrients: Various nutrients are also required by plants for synthesis of protoplasm. Temperature: A range of optimum temperature is also necessary for growth in a plant. Any deviation from the optimum range can be detrimental for the survival of plant. Differentiation: The process which leads to maturation of cells is called differentiation. During differentiation, a few or major changes happen in protoplasm and cell walls of the cells. Let us take example of tracheary element. The cells of a tracheary element lose their protoplasm and develop a very strong, elastic, lignocellulosic secondary cell walls. These changes help the tracheary element to carry water to long distances even under extreme tension. Dedifferentiation: A differentiated cell can regain its capacity for cell division under certain conditions. This phenomenon is called dedifferentiation. Formation of interfascicular cambium and cork cambium from fully differentiated parenchyma cells is an example of dedifferentiation. Redifferentiation: A dedifferentiated plant cell once again loses its capacity to divide and becomes mature. This phenomenon is called redifferentiation. Plasticity: Some plants show different growth pathways in response to environment or to phases of life to form different types of structures. This ability of plants is called plasticity. For example; the leaves of coriander are of different shape at a younger stage than at a mature stage. This phenomenon is called heterophylly. Heterophylly can also be seen in cotton and larkspur. Leaves of buttercup are of different shapes when they grow in water than when they grow in air. This is another example of plasticity.